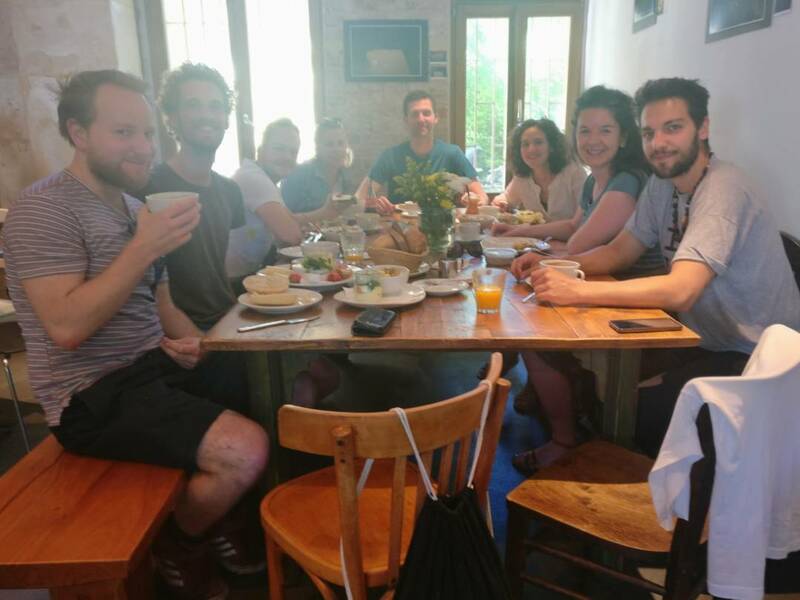 Eight members of the 4CITIES Alumni Board (Cecilia, Josh, Hanne, Pepijn, Sonja, Viktor, Peter, and Kai) from six different cohorts met in May for a weekend retreat in Berlin. Our task was to conceptualize and plan the 2017 September Salon, to be held in Brussels on Saturday, 23 September. But what is a 4CITIES approach to planning a 4CITIES alumni event? 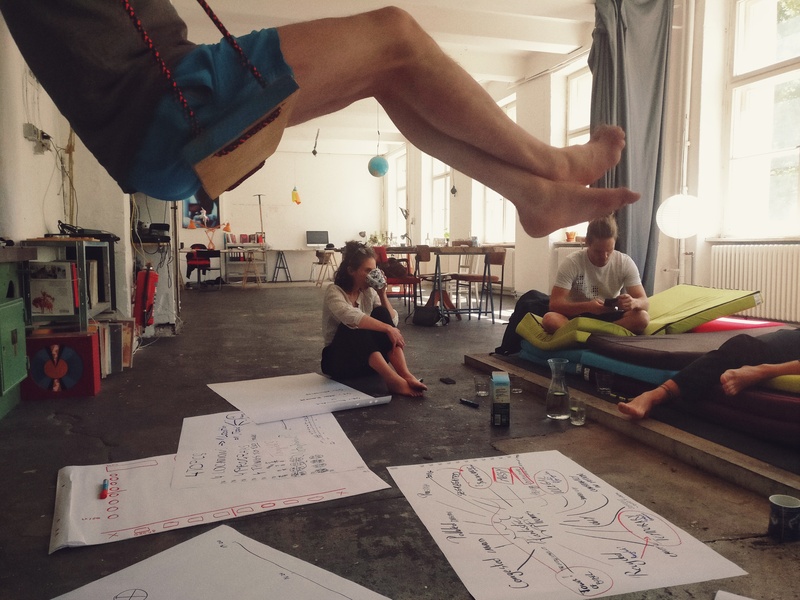 Apparently, it involves ping pong, paddle boarding, urban exploration, and Berlin’s finest culinary attractions, as well as a creative environment that is open, critical, and highly collaborative. It is late morning in Berlin, and the alumni board meeting is not supposed to start until the afternoon. While I stroll around the city looking for ice cream, among many faces coming towards me at the pedestrian crossing is a friend who now lives in Norway. A friend who, for whatever reason, found himself at this same crossing in Berlin, at the same time as me. We laugh at the coincidence, we talk, we part. Jumping from a train onto a bike with a basket full of Oleander, I make my way to the Hidden Institute in the vast Berlin neighbourhood of Neukölln. Eight 4CITIES alumni, myself included, are here to join forces and give shape to the 2017 September Salon, our annual alumni event. Ideas have been discussed over Skype and email and other online platforms, but half of us have never met. It is quite daunting to finally meet the others—to see the faces that belong to the brainstorming voices and to get to work. The original idea for the September Salon came from 4CITIES founding father Eric Corijn. During the graduation weekend each year in September, the outgoing cohort, incoming cohort, and teaching staff all meet in Brussels. It’s a chance to fashion a bow out of the elusive red threads that weave their way through the 4CITIES experience and give the new students a proper first impression of the program. By 2015 the number of 4CITIES alumni had climbed past 100, and it seemed time to develop some kind of alumni network. So why not invite alumni to join the graduation weekend in Brussels and make a real event out of it? 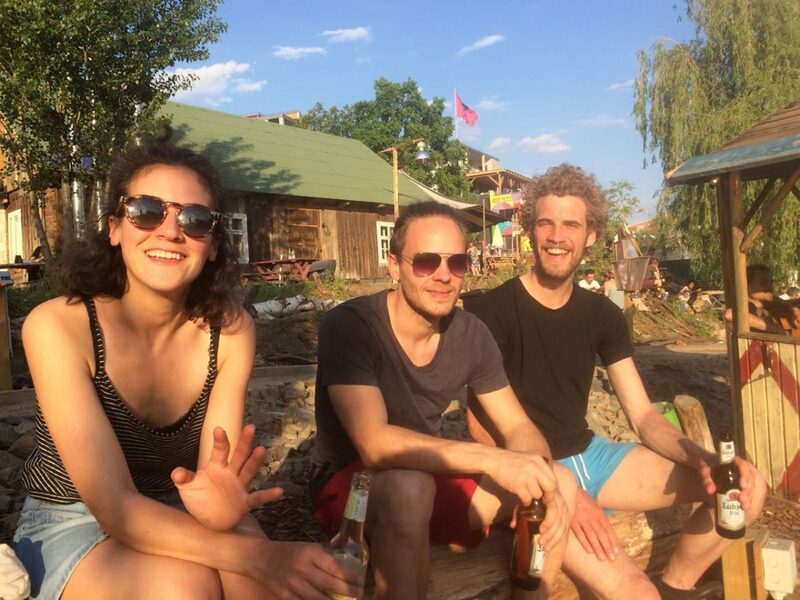 Berlin, securely landlocked in the heart of Europe, has a fascinatingly laboratory vibe to it. It is a place where urbanity is negotiated in many ways. However, this is no longer done mainly by a multifaceted array of counter-mainstreams, but increasingly, by tourists and big money. Nevertheless, immediately on arrival are we drawn back into the 4CITIES atmosphere by the city’s overflow of hyper-diversified and –localised urban activisms (not to mention counter-activisms), which also is exemplified by The Hidden Institute, an alternative cohabitation consciously shaped by a set of idealistic principles. Thus, our work unavoidably was dominated by a desire to catch the experimental feeling of Berlin—or at least to pay it homage through meagre imitation. Imagine it is Sunday, a hot summer morning in Berlin Neukölln. You slept little but well. You stand inside a big lofty space with pleasantly cool concrete floors that you touch with your bare feet after leaving shoes and socks behind at the entrance. This detail is absolutely essential: Liberating your toes from their textile guardians really affects your experience of the space and probably even your ability to think freely and wholeheartedly. The sun shines through big windows and fills the entire room with bright daylight. You have entered The Hidden Institute. The big question in 2015 was whether anyone would attend an alumni gathering. 4CITIES graduates come from the far corners of the globe and typically stay busy with work and projects and adventures. Would they take the time and make the effort to reunite? The turnout was even better than hoped for, and so in 2016 we asked whether we could organize the event around a theme and bring in experts from beyond the 4CITIES family. That, too, proved successful, as a half-dozen speakers, including Jon Coaffee from the University of Warwick, joined featured alumni in presenting and discussing a variety of perspectives and projects dealing with the topic of the “City at War.” For 2017, the driving question was how we could make the September Salon as fun, creative, and interactive as possible, and how the event could move outside into the city streets. A lot of work has gone into the 4CITIES Alumni Board (4CAB) these past two and half years. Both the alumni who have been there since we started and those who have joined along the way have volunteered countless hours, spent more time on Skype than is probably healthy, and simply done everything possible to kickstart the 4CITIES alumni network. We haven’t been very efficient, but by continually experimenting we are finding a process and format that seems to work. 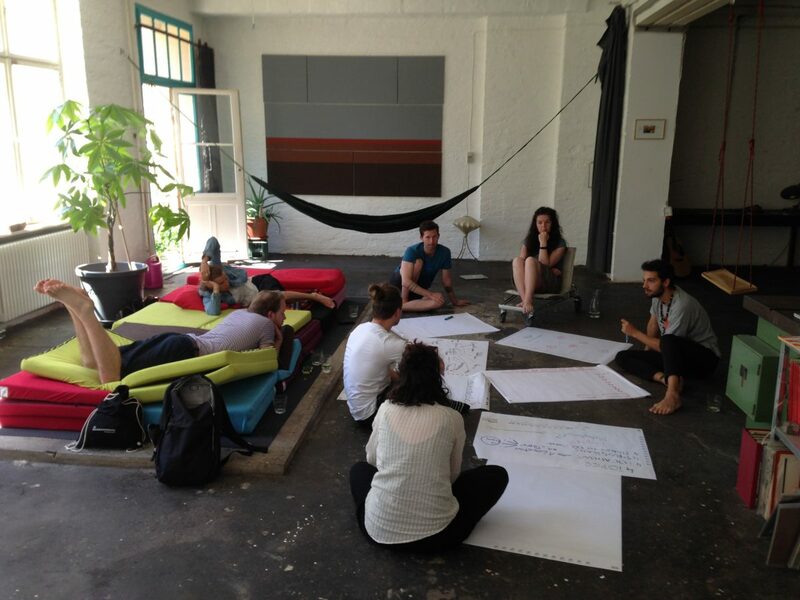 For the September Salon, this means forming a new team each year and organizing a retreat weekend each spring to reimagine and reinvent the Salon completely, and to let the dynamic of group work so central to 4CITIES evolve beyond the confines of the program. A plan is always a good thing to have. Yet, it was proven on this weekend that a plan cannot be fashioned in any straightforward manner. A billion ideas developed, at first glance promising and upon reflection hopelessly unrealistic. Scribbled on gigantic pieces of paper, they lay discarded around us as manifestations of our increasingly strained search for sense. The great design that we had concocted one day, perfecting it by the candlelight of evening, proved glaringly vulgar when scrutinised in the light of the following day. The Berlin retreat was like a flashback to the early days of 4CITIES and especially the endless hours of discussion during Urban Analysis, but in a nice way 🙂 It was a very constructive weekend, and seeing how motivated everyone is to make the best out of the alumni weekend proves the urge and need to construct in the first place an alumni network. It also reminds us to constantly question what we are doing, how we are doing it, and for whom we are doing it. Being a part of 4CAB from the very beginning, I have seen it evolve in an organic way, and the things we achieved so far are great, when you consider that it is all based on voluntary commitment. But there is still so much potential to grow. Having a small budget and being able to meet in person to discuss, explore, debate, and have fun is exactly what we needed to stay motivated and fresh. Hoping to find – and knowing how to find – places and faces from our other lives in (un)familiar spaces and at unexpected times turned out to be a bit of a theme of our 4CAB meeting in Berlin. We talked about cities, about philosophy, about photography. We read out loud. We took long walks and noticed the trees, the buildings, the public space and street life and traffic patterns and many other mundane details that come together to make Berlin, or any city, some place special. And in the process we got to know each other. We even ended up with a plan for the 2017 September Salon that excites us all. And we finished off the weekend with some pretty decent ice cream. Thank you to 4CITIES, UNICA, and Hidden Institute for the support and to all members of 4CAB past and present for putting in the work.